I have finally finished my student teaching. My finger prints have been submitted and I'm waiting for my certificate to arrive any day. If you know of a middle school Language arts or Social Studies position in the area please let me know. Now that I have finished up with school I've finally had some time to spend in my stamp room. 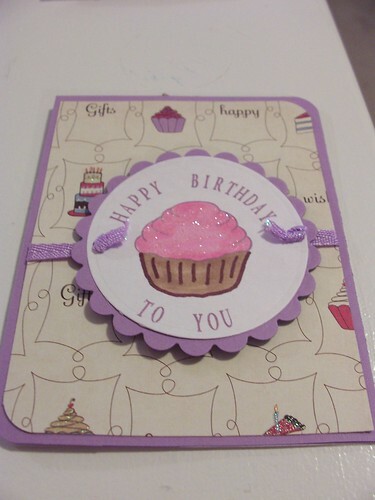 Recently I have been putting my Just Rite stampers and Spellbinders to good use. I purchased an alphabet to go with my monogrammers. I have to say the letters are TINY and I've already lost a couple but they are definitely worth the effort! I also purchased the larger stamper and 25pt alphabet to play with. The set comes with a cupcake to put in the center of the stamp. I used some long forgotten glitter to add sprinkles to my cupcake. I love how versatile these stamps are. 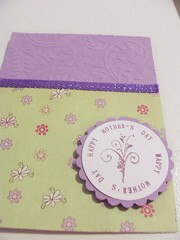 It's nice to create a one of a kind sentiment for each card.